(R.R.P £269.99). 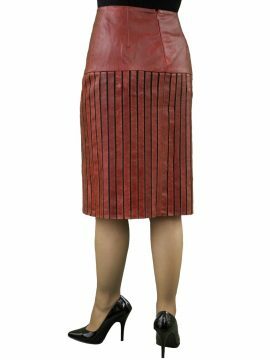 Beautiful quality – a below-knee length black flared leather skirt in luxury soft lambskin nappa leather, sourced from British hides. From the waistband, it flares and falls to give a soft fullness and shapely elegance. Easy to wear and versatile – to suit many occasions and outfits, smart or more casual As a feature, the hem is left unfinished with a raw edge to allow the skirt to float naturally. 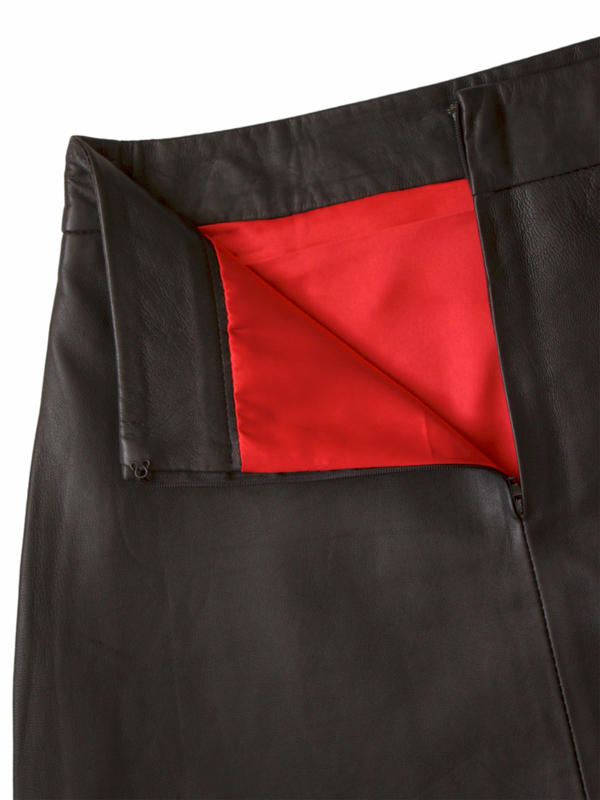 The skirt fastens at the rear with a 7in/18cm hidden rear zip and hook-and-eye. Length (from waist to hem): 27in/66cm. It has a full loose lining in red satin fabric (100% polyester). Made exclusively for the Tout Ensemble label by Ashwood. NOTE: This same style is also available as a 20in knee-length skirt. Click here to view. Beautiful quality and so elegant, a below-knee length black flared leather skirt in luxury soft lambskin nappa leather. Versatile and easy to wear, it is tailored to sit at the waist. From the waistband, it falls to give a soft fullness. The hem is left unfinished with a raw edge to allow the skirt to float naturally. The skirt fastens at the rear with a hidden zip and hook-and-eye. It has a full loose lining in a gorgeous red satin fabric (100% polyester). Tailored exclusively for Tout Ensemble by Ashwood to our own design.